Truck of the Year in 1991 and constantly improved with each generation, the Renault Trucks Magnum has now become a legend. 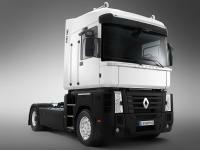 That's why Renault Trucks decided to launch the Magnum Legend - a special edition limited to 99 vehicles only. With elegant discretion, this special edition comes dressed in a matte black finish for the technical platform contrasting with a pure white cab. Connoisseurs will recognise these to be the colours of the AE, the Magnum's ancestor unveiled to the public for the first time in 1991. The Magnum Legend further states its prestigious credentials with an upmarket finish including aluminium passenger and driver step trims as well as chrome plated nut caps and hubcaps. The doors, again echoing the first AEs, feature a plate bearing the official serial number, to enhance the owner's pride of having such a unique vehicle. This exclusiveness can also be found inside the cab with its totally designer atmosphere, combining elegance with tasteful understatement created by the use of noble materials. The driver is welcomed by leather upholstery featuring the Magnum Legend logo and the truck's serial number. The dashboard trim and the bunk are also in leather. The specific matte black colour also reappears on the dashboard. From a technical point of view, the Magnum Legend is the culmination of all the new features introduced on the vehicle throughout its career. Magnum Legend is not only offered with the most powerful engine in the range – the DXi 13 520 hp - but it also complies with the EEV standard, currently the most exacting in terms of pollutant emissions for road transport. Optimised to deliver even greater fuel consumption savings, it features the Optidriver+ gearbox and the Optiroll pack which makes maximum use of the vehicle's inertia. In terms of safety, the vehicle comes with the best possible braking as standard, i.e. 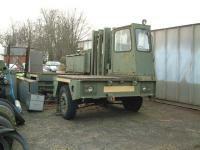 : full EBS and a Voith hydraulic retarder. For its promotional campaign, this Magnum Legend is also being associated with another legend: Steve McQueen. A huge enthusiast of motorsports and everything automotive, Steve McQueen made his mark on the cinema with his appearances in the movies Le Mans and Bullit.